The fish is a sign that Christians have used to identify themselves to one another throughout history. 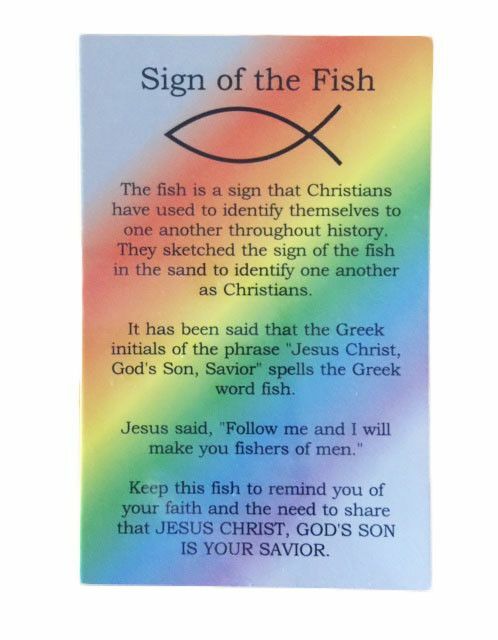 They sketched the sign of the fish in the sand to identify one another as Christians. It has been said that the Greek initials of the phrase "Jesus Christ, God's Son, Savior" spells the Greek word fish. Jesus said, "Follow me and I will make you fishers of men." 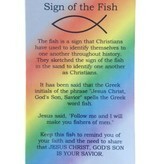 Keep this fish to remind you of your faith and the need to share that JESUS CHRIST, GOD'S SON IS YOUR SAVIOR.